This is the second posting in this series in which I highlight the basic research which led to seminal breakthroughs in the medical field, brought on by the result of basic inquiry, thorough and detailed investigation, meticulously following the scientific method, and eventually leading to development of important medical therapies. In his autobiography, Virus Hunting: AIDS, Cancer & the Human Retrovirus: A Story of Scientific Discovery, Dr. Robert Gallo, M.D. describes a wonderful story of the history behind, scientific biographies, and chronology of the discoveries which led he and his colleagues (including co-discoverer Dr. Luke Montagnier) to recognize retroviruses (in particular HIV) as the leading culprit for the cause of AIDS and in the etiology of Kaposi’s sarcoma. For anyone who appreciates the history behind scientific discoveries and appreciates learning about the multitude of individual efforts which are the crux of seminal research, this book is a must read. While a fascinating aspect of this book is the description, like fitting pieces of a puzzle, of the important discoveries throughout history which are the necessary foundations for further investigations and discoveries, more important is a telling, personal narrative of the people involved in those initial and subsequent discoveries. In fact, the book has over 396 colleagues, mentors, technicians, students, and even critiques who are given credit, in one form or another, for the ultimate discovery of HIV as a causative agent for the development of AIDS. The book is a literal Who’s Who in Science and shows how important personal collaboration and friendships are in the process of scientific discovery. which may explain some of the early work by Rous concerning the Rous sarcoma virus. Enter in Gallo’s good friend Dr. Bob Ting. Dr. Gallo had known Dr. Ting socially since 1966, shortly after Gallo had arrived at NIH. 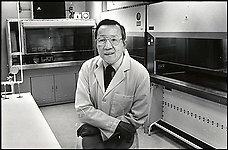 Dr. Bob Ting was a well-established NCI investigator, who was doing work on DNA and RNA oncogenic viruses of animals. Originally from a large and wealthy family in Hong Kong, Dr. Ting had worked with Nobel Prize winners Salvatore Luria (who worked on phages) and Renato Dulbecco, who, along with his well-known cell culture media, had made the seminal discoveries that led to our knowledge how some DNA viruses can transform normal animal cells into neoplastic-like cells in culture. Bob Ting gave a talk on these oncogenic viruses and Gallo was very interested in his observations that oncogenic viruses like Rous and Maloney, could transform cells in vitro in a matter of days. A friendship developed between the two over tennis matches and Chinese food. During this time, Dr. Ting made the important suggestion that they both collaborate and use the viral systems developed by Dulbecco. Ting also introduced him to RNA viruses, Dr. Robert Huebner, and Dr. Howard Temin. It was, in part, due to these associations that Gallo started looking, in earnest, at the possibility of RNA retroviruses in leukemias. Thus, just like the internet today, connections and networking provided new insights into current research, and helped lead the advent of new discoveries, therapies, and scientific disciplines. Therefore, “after some late-night discussion with Bob Ting, I decided to enter the fray. My own laboratory, … would immediately be set up to compare the properties of reverse transcriptase enzymes from many different animal retroviruses”. Although the rest is more history, this early friendship, collaboration, and mentoring by Bob Ting had “transformed” Gallo’s research efforts to set him up to make some of the important discoveries eventually leading to the discovery of the role of HIV in AIDS. A very nice writeup/obituary for Dr. Ting was written by Patricia Sullivan of the Washington Post and is included below. Robert C.Y. Ting, 77, a research scientist who started one of the early biotechnology companies in the Washington area, died Sept. 11 of complications after cardiac surgery at the Cleveland Clinic in Cleveland. Dr. Ting founded Biotech Research Laboratories Inc. in Rockville in 1973, producing cells for government scientists to use in research. Eleven years later, his firm obtained a federal license to develop and produce the first FDA-approved diagnostic test kits for HIV antibody confirmation. Robert C. Gallo, who co-discovered the HIV virus as the cause of AIDS, called Dr. Ting a pioneer in the field who popularized the term “biotechnology” when he moved from research to entrepreneurship. “He introduced me to virology, and he did it twice,” said Gallo, director of the Institute of Human Virology in Baltimore. The men had known each other since the 1960s, and while playing tennis one day, Dr. Ting advised the cancer researcher to look at new research in viruses. Later, when Gallo was studying leukemia, Dr. Ting directed him to animal research in leukemia. “First he showed me how viruses change cells. Then he introduced me to retrovirology. . . . I went into retrovirology solely because of those discussions with Bob Ting on tennis courts,” Gallo said. Dr. Ting, whom Gallo described as a quiet, modest man, was born in Shanghai, the son of a physician to Gen. Chiang Kai-Shek. His family fled the country during the Japanese invasion of China during World War II and moved to Hong Kong. Soon after, he moved to the United States, where he received a bachelor’s degree and in 1956 a master’s degree in genetics from Amherst College. He received a doctoral degree in microbiology and biochemistry from the University of Illinois in 1960 under Salvador E. Luria, who later won the 1969 Nobel Prize in Medicine and Physiology. Dr. Ting spent the next two years on a postdoctoral fellowship at the California Institute of Technology, working with Renato Dulbecco, who later won the 1975 Nobel Prize in Medicine and Physiology. Their work focused on how viruses cause tumors. Dr. Ting joined the National Institutes of Health in 1962 as a visiting fellow and then a senior research scientist at the National Cancer Institute. From 1966 to 1968, he was an associate editor for the Journal of the National Cancer Institute. In 1969, he joined Litton Bionetics Inc. in Rockville as director of experimental oncology, leading a project funded by the institute to search for viruses in human leukemia patients. He became scientific director of the cancer research branch the next year. With academic, government and private business experience under his belt, Dr. Ting decided to go into business on his own and in 1973 started Biotech Research Laboratories in Rockville. It was a profitable supplier of research services and supplies until 1981, when it went public and produced the HIV diagnostic test kits. It became one of the most successful public biotech companies in the area in the mid-1980s. He returned to the United States in 1998 to join the board of Cell Works Inc. in Baltimore, and became chair and chief executive of a joint venture, Cell Works Asia Limited, in 2000. Most recently, Dr. Ting was the founding president and chief executive of Profectus Biosciences Inc. of Baltimore, previously known as Maryland BioTherapeutics Inc.
Dr. Ting was past chairman of the F.F. Fraternity, one of the oldest Chinese fraternities in the United States. He was also a member of the Organization of Chinese Americans in the D.C. area since its inception in the early 1970s. He enjoyed tennis, golf, ballroom dancing and international travel. He also was a wine connoisseur. Survivors include his wife of 44 years, Sylvia Han Ting of Potomac; three children, Anthony Ting of Shaker Heights, Ohio, Andrew Ting of Beverly, Mass., and Jennifer Chow of Potomac; seven sisters; and seven grandchildren.